In a trend that seems to buck the standard of increasing digitization of music, movies and television, the record industry has seen a well-publicized growth in vinyl sales in the past five years. During this “vinyl revival,” sales of LPs tripled from 2008 to 2013, and vinyl sales are already up more than 40 percent in the first half of 2014. But the story of vinyl tells a bigger story about the affection people feel towards physical things in the digital age. While most people are pragmatic about the advantages that the digital world can give them, they also miss the emotional aspect associated with physical objects. Photos, too, are returning to a physical space. While nearly every mobile phone sold today has a camera attached, instant cameras are making a comeback. Despite its near demise in the early 2000s, Polaroid and its classic instant photos can now be found in every Urban Outfitters and have garnered a new type of cult status. In fact, another company that is popularizing analog photography, Lomography, just announced a brand new instant camera, funded in typically modern fashion, through a Kickstarter campaign (by millennials for millennials). Lomography actually makes most of its money through the sale of old-fashioned film cameras and the cameras that use it. Similarly, every company should strive to have a marketing campaign that capitalizes on the positives of both the digital and the physical. Especially if your business is web-based, give customers a way to continue their experience offline as well. Now that digital advertising has come of age, marketing that makes good use of the physical can tap into a novelty factor. It may not be immediately obvious how to take full advantage of physical marketing but you need look no further than some of the top digital brands for some easy and cost-effective ideas. Stickers, now included in every Apple item and an increasing number of other hip products, can turn consumers (or even would-be consumers) into mobile advertisers. Reddit, for one, contributes the success of the company in part to an initial $500 investment on stickers. Stickers work because they turn a marketing opportunity into a unique experience for the user, inviting the small, but fun action of sticking it wherever they want. Whether someone sticks them on a light pole, a restaurant wall or their laptop, build a visible community of users. 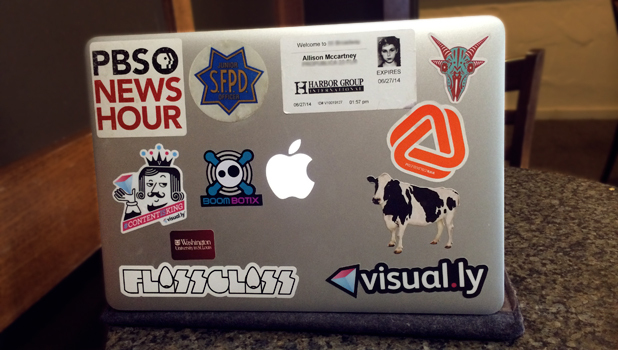 The author’s laptop is a mobile advertisement for her brand communities. While swag is nothing new, the growing fixation on the physical raises the bar for creating special experiences that reward users and perpetuate positive feelings about a brand. Your customers are creative people too; just give them the objects and opportunities they need to help shape the brand along with you. Allison is a former editor at the PBS NewsHour, a 2014 AP-Google Journalism and Technology scholar and a soon-to-be graduate student in journalism at Stanford University. You can follow her on Twitter @anmccartney.